"Writ petitions will be heard after the orders in the review petitions," the bench, also comprising justices SK Kaul and KM Joseph, said. Supreme Court in its 4:1 verdict had allowed entry of women of all ages into the Sabarimala Temple. 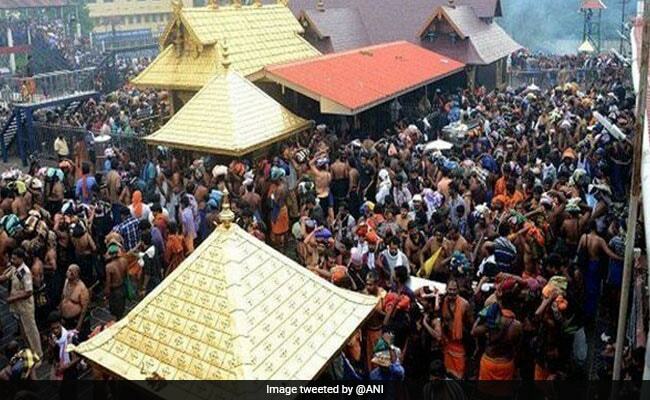 The Supreme Court today made it clear that fresh pleas related to the Sabarimala Temple will be heard only after it decides the earlier petitions seeking review of the judgment allowing entry of women of all age groups into the shrine in Kerala. A bench of Chief Justice Ranjan Gogoi said a five-judge bench is scheduled to hear in-chamber the review petitions at 3 pm today. The bench stated this while hearing the three fresh petitions filed by G Vijaya Kumar, S Jaya Rajkumar and Shailaja Vijayan challenging its September 28 verdict. If the top court decides to review the verdict then the three fresh petitions will be heard along with the review petitions. But, if the court rejects the review petitions then the fresh petitions will be heard independently on merit. A batch of 48 petitions seeking review of the judgment would be taken up for consideration in-chamber by a bench of Chief Justice Gogoi and justices RF Nariman, AM Khanwilkar, DY Chandrachud and Indu Malhotra. The top court had on October 9 declined an urgent hearing on the review plea filed by an association which had contended that the five-judge Constitution bench's verdict lifting the ban was "absolutely untenable and irrational". A plea filed by the National Ayyappa Devotees Association (NADA), which has sought review of the verdict, had said, "The notion that the judgment under review is revolutionary, one which removes the stigma or the concept of dirt or pollution associated with menstruation, is unfounded." "It is a judgment welcomed by hypocrites who were aspiring for media headlines. On the merits of the case, as well, the said judgment is absolutely untenable and irrational, if not perverse," it had said. Besides the association, several other petitions, including one by the Nair Service Society (NSS), have been filed against the top court verdict. The NSS had said in the plea that as the deity is a 'Naistika Brahmachari', females below the age of 10 and after the age of 50 years are eligible to worship him and there is no practice of excluding worship by females. "Hence, the delay or wait for 40 years to worship cannot be considered as exclusionary and it is an error of law on the face of the judgement," the plea had said.